Read the Manual and Prepare to be AMAZED! Absolutely Amazed! My wife and I bought this thing a week ago. We have run multiple programs already, and are absolutely amazed! We have already recommended this blender to multiple people who are experiencing the same results! If you are willing to read the short instruction manual that's full of illustrations, you will not be disappointed and will have found an amazing new appliance for your kitchen. This started with us shopping for a new blender. My wife and I are using smoothies to get more nutrition into our diets. We have collected a number of personal sized blenders over the years that are clearly passed their prime. As I began searching the web for the best blenders, I was surprised and very interested when I learned that Instant Pot had a blender that was getting some good nods. We have an Instant Pot Ultra cooker that has changed our lives! We use it most days of every week for a variety of things and it has been amazing. I therefore thought that if Instant Pot could make a blender that was half as great as their cooker, it would be worth it to try. 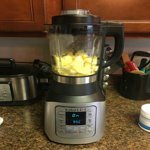 As I researched the blender, I was sold when I saw all of the smart functions it could do, including a dedicated smoothie program, as well as 'hot' programs to cook soups and a self-cleaning feature to boot! We therefore ordered online for same-day pick up and have been using the Ace-60 multiple times of every single day since with amazing results! We have so far made smoothies, two incredibly perfect creamy soups, all kinds of fresh non-dairy milks (almond milk, nut milk, rice milk), and we use the cleaning feature frequently all by just a touch of a button! Just like our Instant Pot Ultra cooker, this Ace-60 blender has opened new horizons for us with food and all the great things we can make that we never thought of before thanks to the incredible power and convenience. For the record, my wife and I like to get the most out of our purchases; we read the manuals. Before you discount this, let me just say that this manual is super short, full of illustrations, and is very easy to understand. By doing this simple step to understand the machine, you will consistently get the results you expect. One perfect example is making smoothies. The truth is that all smoothies should be stacked the same regardless of blender - start with liquids, then powders, and work your way up to the hardest solids (usually frozen fruit and ice being last - as in at the very top). By doing this, you don't start frozen hard chunks right by the blades which causes pre-mature wear to the motor and the blades dull faster. If this is not something you feel you want to remember or comply with, then maybe a $500 blender that can make your favorite iron-rich drink out of a box of nails is more for you. If, however, you are willing to just understand the machine by zipping through the manual, this is by FAR the greater value. Perfect smoothies, hot creamy soups, your own fresh non-dairy milks are now so easy and literally a button's push away after dumping in the ingredients and that's it! Once again, Instant Pot comes out with a giant winner that has earned our family's ringing endorsement! *The photo below is 48 oz of perfect Almond Milk from one cup of almonds and some water. We did the same with oats for Oat milk and are looking forward to using the Rice milk setting to make our own Horchata! I sold almost all of my other appliances to consolidate into three main ones, all by Instant Pot. I had a Ninja Blender that i wanted so badly. I was kind of disappointed but it worked gor the few things I used it for. I stumbled upon this one day while looking at other appliances. I went home and researched it, watched videos and knew I had to have it. I am so impressed by it! Absolutely love it so far. Its heavy and sturdy. Capable of so much. It helps me simplify preparing baby food. I also will be using it to make my milk alternatives and smoothies. Another win for Instant Pot! I've had had this for 1 week and have used it multiple times per day since then. I really love it!! The smoothie feature is my favorite; it does an awesome job blending everything up, even small seeds for the most part. I made almond milk for the first time and it was really simple. I also made pumpkin soup and it was hot and blended super smooth. I have not tried the other features like ice cream yet but look forward to it. Just like the Instant Pot pressure cooker, it is really versatile. 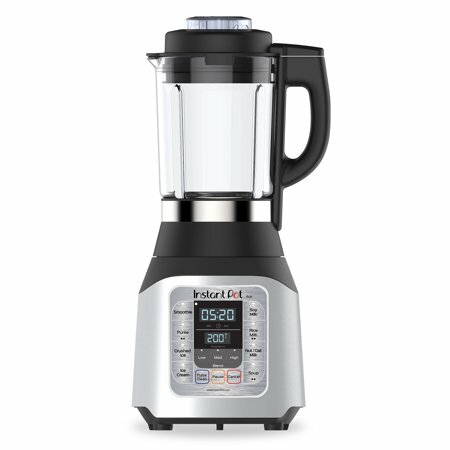 I can't compare this to a Vitamix as I've never owned one, but nor do I think it should be compared since a Vitamix is over 4 times the price, however for what I need it for, the Ace is powerful and Instant Pot is a company I trust. I am debated taking off 1 star since it's just a little too large to fit on the counter under my cabinets with the lid on but decided not to since it does fit under without the lid and it looks really nice on the counter. The jar is a little heavy since it's glass but that is not an issue for me and it feels like a unit that will last. I have also had no issues cleaning it. 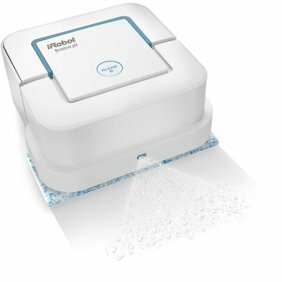 The cleaning feature is great. A word of caution, don't put cheese in the blender as I've heard it can burn at the bottom if you are using the soup feature. This one is a must have, superb quality that the Instant Pot brand is known for! I have used it daily since unboxing it. Soup, smoothies, ice cream, and etc. So versatile... I am 100% satisfied with this purchase. Could not have been easier to make cauliflower-potato soup! It was perfectly smooth and not any mess. Cannot wait to try the other functions. Everyone should have an Ace Blender!! We absolutely love our Ace Blender and InstaPot has the BEST customer service!! A great product that they stand behind!! Instant Pot does it again! Photo on box looks like the glass carafe comes apart for easy cleaning but it does not. I made soup and it scorched on the bottom and after trying to clean it several times some is still on the bottom. Should have included recipes for soups and smoothies.